Dental implants are by far the most advanced, versatile and lifelike option for replacing a single missing tooth, several missing teeth or all teeth. A dental implant is a biocompatible titanium post that is surgically placed in a patient’s jawbone. After placement, the living bone will fuse with the implant through a process called osseointegration. Once osseointegration has occurred, the implant will be more sturdy than a normal tooth root. Therefore, an implant is strong enough to hold several missing teeth or a denture in place. As a result, a person can chew, smile and laugh without any fear their teeth or denture will come loose. The “All on 4” or “teeth in a day” procedures are the latest advancement in implant dentistry. 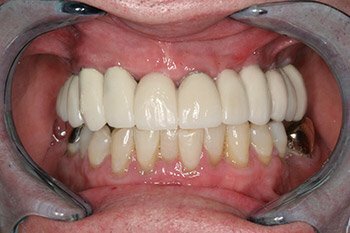 With this treatment a person can have any remaining teeth removed, have several implants placed (typically 4-6 implants) and have a denture-like prosthesis attached to the implants. Thereby allowing a person to quickly gain the ability to chew and smile normally. As with normal teeth, dental implants must be maintained by daily brushing and flossing, along with routine visits for professional cleaning and examinations. 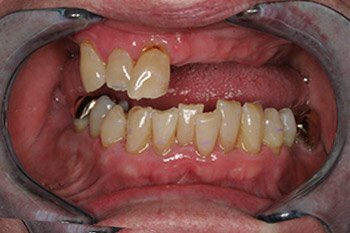 This patient had 8 implants placed in their upper gums to replace all of their upper teeth by Dr. Meiss.